Today’s post is doing double duty. In the first half, Jean Coday has long been the driving force behind the Laura Ingalls Wilder/Rose Wilder Lane Home and Museum. Coday’s interview reveals how she got involved with the museum, what role she’s played, and a little bit about Laura’s life in Mansfield. In the second half, I’m going to talk about oral history as a research method. Not a lot of people have a very clear idea in their minds of what research looks like. I like to share examples to help people clarify it in their minds. This is an excellent example of what an oral history interview is like. An important part of oral history is including indexes and transcripts. Below the video are my notes with general time codes. 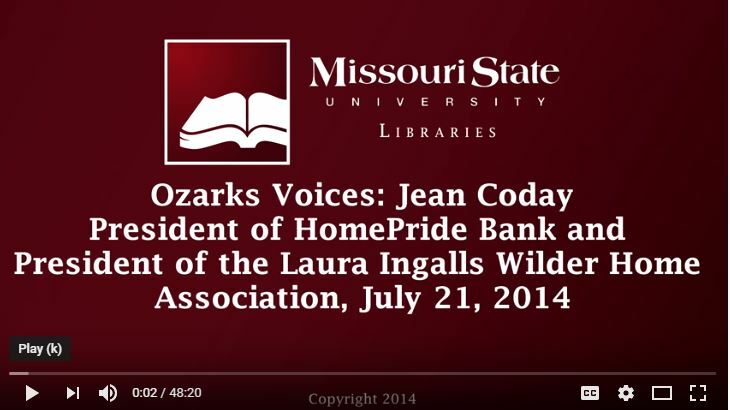 Ozark Voices is an oral history project undertaken by the Missouri State University Libraries. The interviewer is Tom Peters, Director of Library. It was shot in the director’s office at the Rocky Ridge complex. Coday also serves as President of HomePride bank in Mansfield. Coday is from Ash Grove, Missouri. Why did the Wilders settle in Mansfield? What happened to bring them specifically to Mansfield? About 35 minutes – People don’t consider Laura a Missouri author although Laura lived decades here. Twain is even though barely visited as an adult. Laura is a Missouri author by choice. Didn’t buy additional land until 1990 when bought the Rock House and 50 acres for 100,000. Paid that back and bought place across the way. Last buy was 87 acres that horseshoed around homesite. Still paying that off. Hoping will increase visitation. Think will add 15% to visitation and hope that will encourage town to create more tourist supported businesses like hotels, bed and breakfasts, etc. They still have contacts almost every week about someone wanting to do an article. She re-reads the “Little House” series every year. A good idea with oral history is to be part of a larger project like this one from Missouri State University Libraries. It makes it easier for people to find your efforts and helps guarantee that the work won’t disappear after you die. Have a list of questions over subjects you think they’ll know about. Try to make the subject comfortable. An important part of oral history is also making a transcript. While transcripts don’t always pass on the nuance of a recording, a print version makes it easier to scan to find and search and print formats are usually more stable than those of audio or video. YouTube does do an auto transcript, but I don’t see any attach transcript although they may have one separately. You control your environment. People are going to be listening to this hopefully for decades. Pay attention to the sound. Get rid of background noises like lawn mowers by requesting they wait or waiting yourself. Have a good quality mic. October is not only National Information Literacy Awareness Month, but it’s also National Arts and Humanities Month. Kansas Humanities has really been the only agency I’ve seen doing much to celebrate, but I appreciate their efforts. Sarah S. Uthoff is main force behind Trundlebed Tales fighting to bring the History, Mystery, Magic and Imagination of Laura Ingalls Wilder and other greats of children’s literature and history to life for a new generation.Attend one of her programs, schedule one yourself, watch her videos, listen to her podcast, and find her on Facebook, Twitter, Google+,LinkedIn, and Academia.edu. She is currently acting President of the Laura Ingalls Wilder Legacy and Research Association. Professionally she is a reference librarian at Kirkwood Community College and director of the Oxford (Iowa) Public Library.